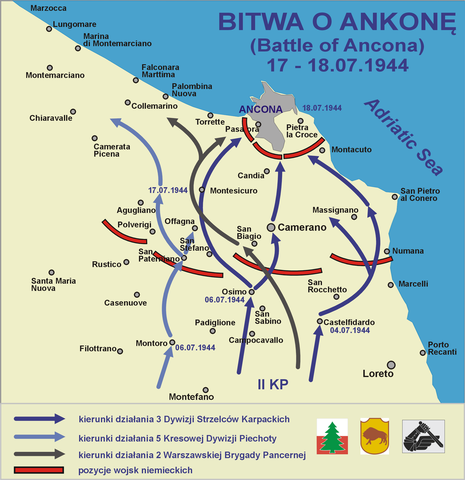 The Battle of Ancona was a battle involving forces from Poland serving as part of the British Army and German forces that took place between 16 June – 18 July 1944 during the Italian campaign in World War II. The battle was the result of an Allied plan to capture the city of Ancona in Italy in order to gain possession of a seaport closer to the fighting so that they could shorten their lines of communication. The Polish 2nd Corps was tasked with capture of the city on 16 June 1944, accomplishing the task a month later on 18 July 1944. By 22 June 1944 the 3rd Polish Division had advanced to the Chienti River, just to the south of Macerata. 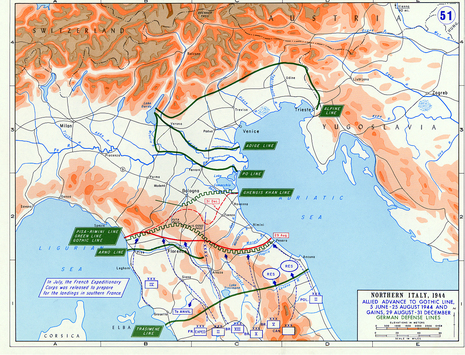 The main immediate objective for the Allies at this point was the capture of Ancona and its harbour as quickly as possible. The Germans were then holding a defensive line on the hills above the Musone River to the south of Ancona. The Allies then took Osino, which overlooks the Musone River, on 6 July.